Carriage rides are not cool, they are cruel. Several more people came to that realization this July when they witnessed a horse that was so scared while pulling a sled in Cleveland that he “kept peeing everywhere”. It all happened when a carriage operator for Shamrock Carriages - which had already earned the ire of animal lovers for an episode last year - forced a horse to walk down a steep hill. Onlookers watched in horror when the horse - unable to control his payload - finally collapsed. 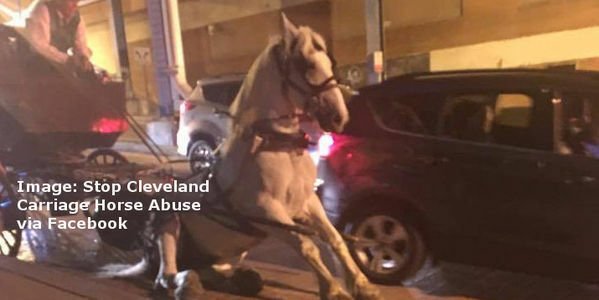 Cleveland is one of many American cities that still allow the wholly unnecessary and completely inhumane practice of horse carriage rides to persist in spite of protests. Throughout the country, from Charlotte to NYC and Cleveland, horses are forced to pull tourists - sometimes through harsh weather - all the while unaware the real cost to the horse. This practice needs to end today. Cleveland mayor Frank G. Jackson should take action now and end this antiquated industry before even more horses are hurt. Sign the petition and say no more carriage cruelty.